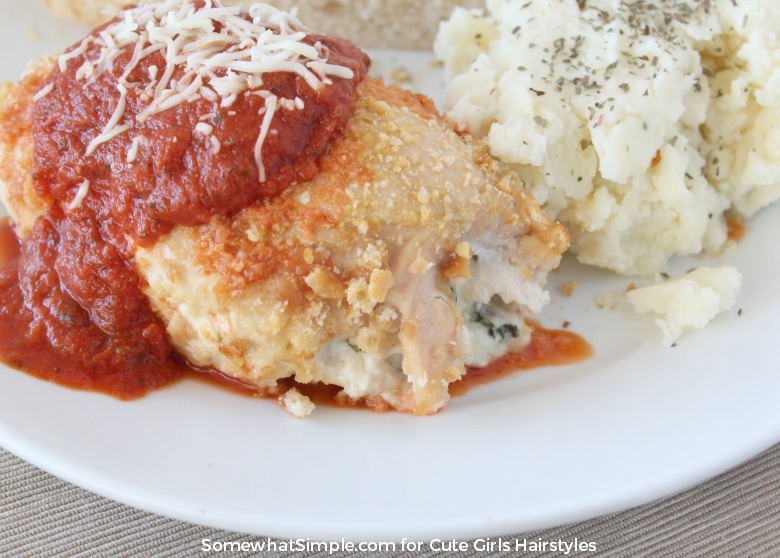 This Stuffed Chicken Parmesan recipe is an easy dinner your family is sure to love! 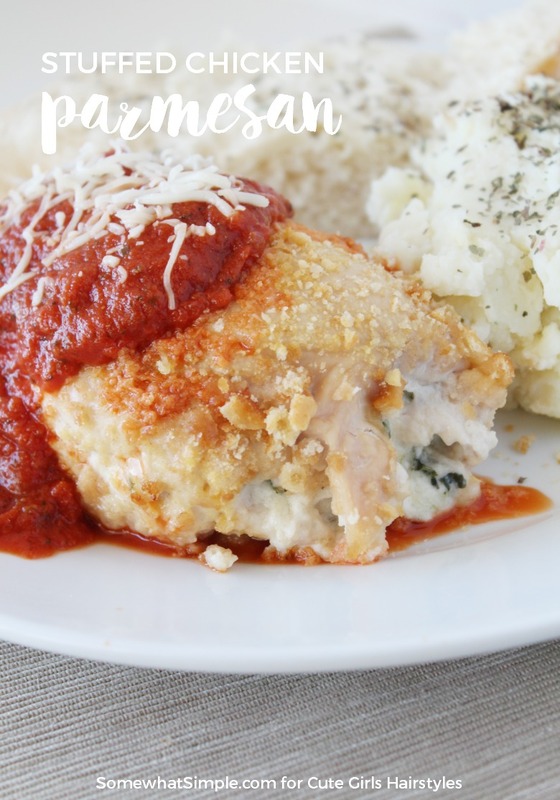 All the flavors of a classic Chicken Parmesan dish wrapped around a melted cheese center – what is not to love? Not only does this chicken taste amazing, it is also super easy to make! Let’s get cooking! *My family likes as little spinach as possible, but you can add as much as you’d like! Heat oven to 375ºF and spray a 13×9 inch baking dish with cooking spray. Pound your chicken to be 1/4 inch thick and set aside. In a shallow dish, beat the egg and set aside. In a separate shallow dish, mix the remaining 3 tbsp. of Parmesan cheese and the cracker crumbs and set aside. Spread the cheese mixture onto each flattened piece of chicken. Starting at the short end of each chicken breast, roll up the chicken tightly, securing with wooden toothpicks. Dip each chicken roll in the egg, then roll in the crumb mixture, making sure each roll is evenly coated. Place the chicken, seam sides down in your baking dish. Bake for 30 min. or until chicken is no longer pink. Remove the toothpicks and heat your pasta sauce. Pour heated sauce on top of chicken and then sprinkle with the remaining 1/2 cup of mozzarella cheese.